I had a pretty dreary year in books. I’m not sure if it was me or the books, but there were very few I’d really recommend strongly. Among fiction, my favorites were all trilogies: Cixin Liu’s Three Body Problem (outstanding hard SF, especially the first volume); N.K. Jemisin’s Broken Earth (not sure if it was worth three Hugos, but it was good); and Kevin Kwan’s Crazy Rich Asians (uneven but entertaining). Bad Blood is about the rise and fall of Elizabeth Holmes and her company Theranos, which promised to transform the field of blood testing. I’ve had a chance to mention this book to a few people who have read it, and we all had the same reaction: utter, stunned disbelief. Even if you’ve read all of Carreyrou’s reporting on Theranos for the Wall Street Journal, you still don’t understand more than a fraction of the story. The whole thing was a long con from the very start, and one that lasted nearly a decade based on literally nothing more than the strength of Holmes’s ability to mesmerize investors, regulators, board members, and even her own employees. You simply have to read it to believe it. 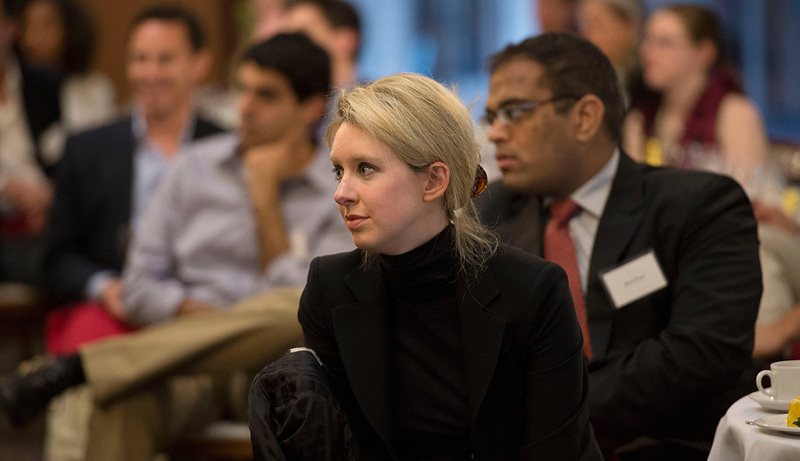 Theranos founder and CEO Elizabeth Holmes in better days during a conference at Stanford University. It’s hard to know what conclusion to draw from the Theranos story. In one sense, it’s such an insane outlier that I’m not sure it really says anything about the rest of Silicon Valley culture. On the other hand, the fact that Holmes could do what she did in the midst of the self-proclaimed smartest people in the world sure doesn’t say anything good about Silicon Valley. In the end, I suppose what it really tells us is just how unprepared most of are for a person who’s willing to lie to our faces persistently and persuasively. This is how Donald Trump gets away with lying to his core base and how fraudulent journalists can ply their trade for so long. As cynical and perceptive as we like to think of ourselves, it rarely occurs to us that someone is just flatly making stuff up, if only because these kinds of lies obviously can’t be sustained, so why would anyone be dumb enough to traffic in them? And yet some people are—or perhaps it’s better to say that they aren’t dumb so much as they combine an eye-watering level of confidence in their ability to BS people on the fly with a fear of being caught out that’s so intense it keeps roping them in further and further. Charles Ponzi had it. Bernie Madoff had it. And Elizabeth Holmes had it. The fascinating question yet to be answered is: will Silicon Valley eventually forgive Holmes and allow her another chance to start a company? If they do, I think we can conclude that most of them are idiots.